Permanent hair reduction by destroying hair roots without affecting the surrounding area. Treat larger areas up to 60 hairs in a few seconds. Suitable for facial hair, legs, arms, underarm and bikini line. Clinically proven and medically tested. Approved for home use with security lock for added safety. Worldwide Voltage Compatible 120-240v (includes UK plug--will require plug adapter outside the UK) Description Get permanent results at home with Rio scanning laser hair removal You can now enjoy the benefits of permanent hair reduction without paying for expensive salon treatments. The Rio scanning laser hair remover treating up to 60 hairs works by sending a laser beam to the hair follicle with enough energy to destroy the root, without it affecting the surrounding area. This process is known as photothermolysis. Unlike home use IPL (Intense Pulsed Light) the results of laser treatments are permanent. The Rio scanning hair remover system has two treatment modes--one treats individual hairs and the other scans larger areas treating up to 60 hairs in a few seconds. Most body hair can be removed using home laser hair removal but the most common areas are the face, underarms, legs, chest, back and bikini line. It is not recommended to use laser hair removal on the eyebrows. Laser hair removal or IPL? Laser hair removal technology actually destroys the hair root giving permanent hair reduction. Home use IPL recommends continued, ongoing treatment of the area to prevent hair regrowth. However, IPL covers a much larger area making treatment of large areas quicker. The other difference is the wavelength of light produced. Lasers produce light with a specific wavelength while IPL uses a broad spectrum of wavelengths. This limits IPL to specific skin types. The laser rapidly heats and destroys the hair follicle to prevent regrowth Laser hair removal explained Lasers deliver an intense beam of light which are made up of a single wavelength or colour. Skin is essentially transparent to light with a wavelength of 808 (nano meters), while melanin containing structures will absorb laser energy of this wavelength. It is therefore possible to target the hair follicle that has a concentration of melanin without affecting the surrounding area. The light energy absorbed by the melanin pigment results in the rapid heating up of the hair follicle. This heat destroys the cells (papilla) responsible for hair growth. If adequate heating is achieved, then the follicle is permanently disabled resulting in a permanent reduction in hair growth. Suitable skin types Melanin in the epidermis also absorbs the energy and limits the depth of penetration of the laser light into the skin. Using a light wavelength of 808nm enables treatment of relatively dark skin as well as fair-skinned types. However, laser hair treatment is not suitable for Afro-Caribbean or black skin complexions. Laser treatment is in removal of white or grey hair. Electrolysis should be considered as an alternative treatment. How to use the Rio scanning laser hair remover Read the information guide and watch the step-by-step DVD for tips and techniques before you get started. For the best results use the Scan mode on hairs that have been trimmed to 1-2 mm in length. It is very important to do a patch test 24 hours before treatment. 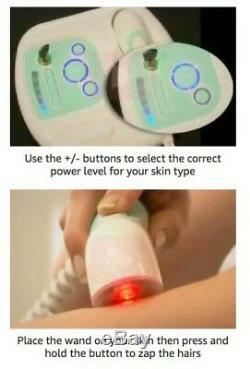 This patch test will confirm the maximum power level for your skin type. Each area to be treated must be checked as skin colour can vary. By using the +/- buttons to select the correct power level for your skin type youre ready to go. Press the Scan button once and place the wand on your skin then press and hold the button on the wand to zap the hairs. After that you can move onto the next area of hairs to be treated until you are done. Treated hairs dont always fall out immediately--they are shed over time as they are released from the hair follicle, so it is important to remain patient. Laser hair removal is generally considered to be effective after six treatments over a six month period. This varies from person to person and the area being treated, hair density, hair growth cycle and colour. Dark hair on fair skin responds best, but both dark and fair hair may take several treatments for long-term results. Some individuals may require more, and some fewer treatments, to achieve satisfaction. Initially you will notice a gradual reduction of the number of hairs. Women who suffer excessive hair growth due to male type hormones are likely to require long term maintenance. How to prepare the skin and hairs for laser hair removal Laser hair removal does not require any special skin preparations. The process is most effective on pale skin so it is best to avoid sunbathing, sun beds and fake tanning if possible The best results are on hairs which are only 1-3 mm long, so we recommend trimming the hairs before treatment. Alternatively, you can shave before treatment as long as the hair is still visible at the root. What to expect after treatment Generally there are no perceptible changes after treatment. A slight redness may occur but will normally fade over 24 hours. Any localised redness after treatment is caused by the destruction of the hair follicles and is quite normal. After treatment, sun exposure or deep tanning should be avoided for at least a week, but if the skin is exposed use a sunscreen. Also avoid using abrasive cleansers or skin peeling treatments and avoid swimming in chlorinated water or using a hot tub for 48 hours. As long as the hair follicle or surrounding skin is not red, sore or inflamed, treatment can be repeated after 24 hours. Most people wait 3-4 weeks between treatments to see which hairs have been shed and to identify new re-growth. When it comes to using other hair removal methods between treatments, laser hair removal needs a hair to be present in the follicle, so hair removal methods which pluck the hair, such as waxing, epilators and tweezing are not suitable for use between treatments. Bleaching hairs is also not suitable as it removes the pigment and renders the laser ineffective. Shaving, micro-dermabrasion discs and cream depilatories however are ideal for use between treatments. 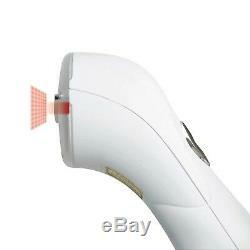 1 x Rio scanning laser hair remover unit and wand. 1 x Power adapter, Worldwide Voltage Compatible 120-240v (includes UK plug--will require plug adapter outside the UK). Box style and product coloration may vary, but it is brand new in a retail box. _gsrx_vers_837 GS 7.0.15 (837). 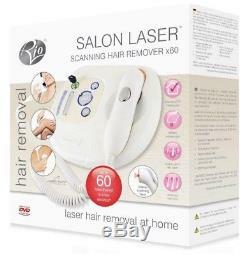 The item "RIO SALON SCANNING 60X Body & Face Laser Hair Remover X60 LAHC 4000 NEW+WARRANTY" is in sale since Thursday, July 19, 2018. 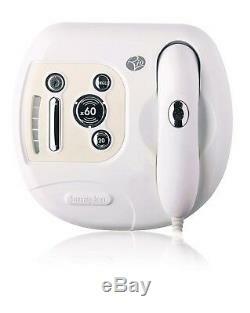 This item is in the category "Health & Beauty\Shaving & Hair Removal\Electric Shavers\Men's Shavers". The seller is "bowman76" and is located in Oxford. This item can be shipped worldwide.